Anant Agarwal is a computer architecture researcher. He is a professor of Electrical Engineering and Computer Science in Massachusetts Institute of Technology (MIT), where he led the development of Alewife, an early cache coherent multiprocessor. He is the founder and CTO of Tilera, a fabless semiconductor company focusing on scalable multicore embedded processor design. He also serves as the president of edX, a joint partnership between MIT and Harvard University that offers free online learning. Mr. Agarwal holds a Bachelor Degree from Indian Institute of Technology, Madras and a Ph.D. in Electrical Engineering from Stanford University. He leads the Carbon Project which develops new scalable multicore architectures, a new operating system for multicore and clouds called fos, and a distributed, parallel simulator for multicore and clouds called Graphite. He also leads the Angstrom Project, which creates fundamental technologies for exascale computing. He contributes to WebSim, a web-based electronic circuits laboratory. He led the Raw Project at CSAIL. Raw was an early tiled multicore processor with 16 cores. He also teaches the edX offering of MIT's 6.002 Circuits and Electronics. His previous projects include Sparcle, a coarse-grain multithreaded (CGMT or switch-on-event SOE) microprocessor, Virtual Wires, a scalable FPGA-based logic emulation system, LOUD, a beam forming microphone array, Oxygen, a pervasive human-centered computing project, and Fugu, a protected, multiuser multiprocessor. Mr. Agarwal holds a Guinness World Record for the largest microphone array, and is an author of the textbook "Foundations of Analog and Digital Electronic Circuits." He received the 2001 Maurice Wilkes Award for computer architecture. In 2007 he was inducted as a Fellow of the Association for Computing Machinery. In 2011, he was appointed as Director of MIT's Computer Science and Artificial Intelligence Laboratory. How does it feel to have so many achievements in your kitty? I've never really thought about it that way. I've always had a quest for knowledge, and for puzzling out problems. I like a good challenge, and this has driven me to projects that I have been involved in. I am also very fortunate to have had the benefit of a top-notch education, and I know first-hand how vital that component is to steer a kid to a fulfilling role in life. That is one reason why I am so passionate about the edX venture. What inspires you and drives you every day to work? 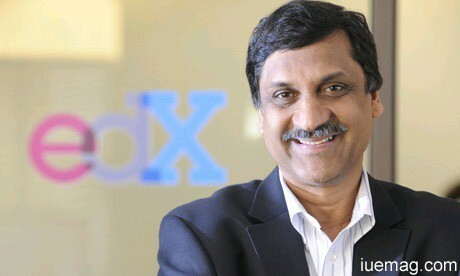 Students have always inspired me, as a professor, as a researcher, and as president of edX. We hear countless stories from our online learners about how this free education is making a difference in their lives. To be a part of that is humbling beyond words. How important is it to have a mentor and do you have one? I have had many mentors over the years, including several professors who have inspired and guided me in my work and studies. I believe that it's very important for young people to have mentors, but of course, it's also important to have guidance throughout our lives. What is the future that you see for today's youngsters? That's a tough question. There are so many uncertainties, but I am hopeful that today's youngsters will have easier access to quality education, and I hope that edX can play a part in that. I think we have already seen some impact in the research results just starting to come out based on the data we have collected. Instructors are excited to try out various components of online education technology in on-campus classes to see if learning outcomes are improved - the early indication is that the answer will be yes. Youngsters may be able to look forward to a very different classroom experience in the future. What were the lessons that you derived from the challenges of your life? Every good challenge has failures as well as successes. I also learned that we must embrace failures, learn from them, and not be discouraged if you truly believe in your work. As I mentioned earlier, my career has certainly had a luck component: a solid education in my field. I was lucky to get a spot in IIT (Madras), and to have the opportunity to study at Stanford. But of course, it was also a lot of hard work along the way, and continues to be. I'm sure you know the saying, "No pain, No gain." Well, that is often true. But hard work is more satisfying when one sees the result. Do you believe in circumstances ruling a person's life? Or do you feel it is the person who rules circumstances? I think it's both. Think about a child born into poverty in a third-world country. There are a lot of challenges for that child to overcome to even survive, let alone succeed. That is why edX is so committed in making access to education easier and available to anyone who wants it. We know that there is a direct link between education level and success. Do what you believe in, and believe in what you do. Any facts, figures or references stated here are made by the author & don't reflect the endorsement of iU at all times unless otherwise drafted by official staff at iU. This article was first published here on 14th January 2014.